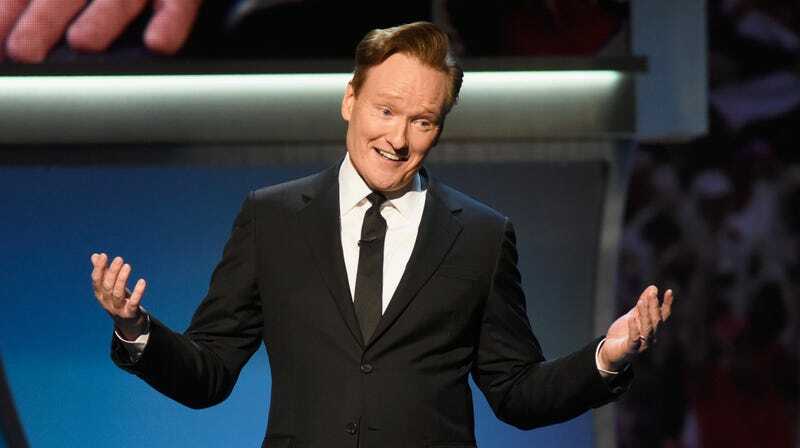 Conan O’Brien’s proven himself remarkably resilient over the years, maintaining his own brand of surreal, off-kilter comedy even after hopping across networks and formats. Next year, his TBS talk show will evolve yet again, dropping to a 30-minute format and eliminating musical acts in an effort to put the host’s comedy centerstage. Now, in anticipation of the changes, O’Brien has announced a touring comedy show, his first since 2010. Team Coco Presents Conan & Friends: An Evening of Stand-Up and Investment Tips kicks off in Washington, DC on November 2, and will feature a rogue’s gallery of handpicked comics that include former and current Conan writers like Rory Scovel, Laurie Kilmartin, Deon Cole, and Ron Funches. Comprised of 18 dates, the tour will hit cities along both coasts, the South, and the Midwest. The news follows O’Brien’s announcement that his entire late night catalog would soon be available for streaming. Tickets go on sale this Friday. Pick them up at the Team Coco website, and check out the full list of dates and supporting comics below.